This week's question about combustion air comes from a blog reader and past client of Structure Tech. We have an older home in St. Paul (1925). We have a newish boiler and water heater. We also, unfortunately, have a giant combustion air intake duct in the corner of our basement that is unsightly and makes our basement a swamp in the summer and freezer in the winter. We recently had a local HVAC guy come to do an annual inspection (based on your recent article and recommendation). When I asked about the necessity of the air duct, he told me that codes were recently updated and that they are actually not necessary in old homes anymore as there are likely enough leaks elsewhere to provide plenty of fresh air. I would absolutely love to remove this thing but wanted a 2nd opinion before doing so. 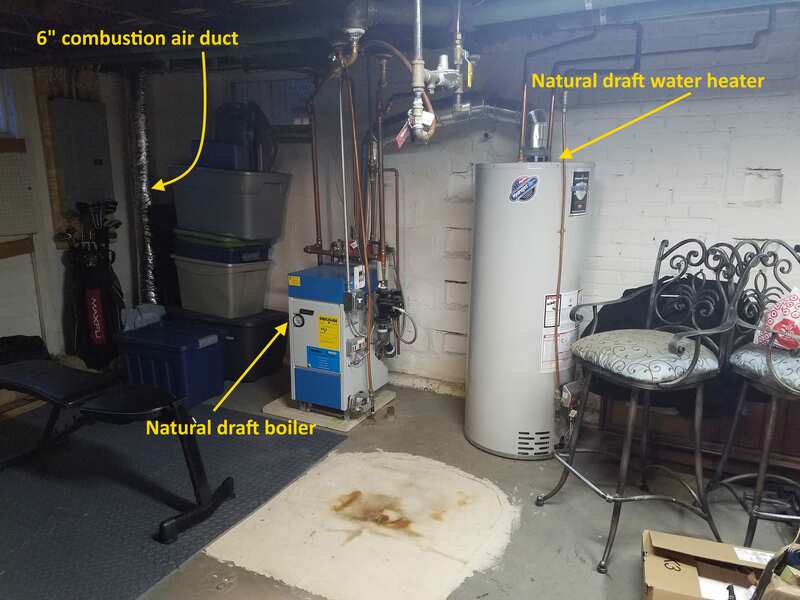 What I see there is a boiler and a water heater, both of which rely on natural draft to get the exhaust gases up and out of the home. In other words, gravity. Hot combustion gases are lighter than the surrounding air, so they rise up and out of the house through the vent. That's how natural draft appliances work. I also see a combustion air duct in the corner of the basement, which looks like a 6" duct. This might feel like a giant duct when there's cold air spilling across the floor, but it's really the most common size. Natural draft appliances are just a little bit scary because it doesn't take much to overpower them. For every cubic inch of exhaust gas that leaves the home, one cubic inch of combustion air must enter the home. If insufficient air enters the home, a natural draft appliance will not draft properly. In those cases, the combustion gases simply spill into the room, rather than rising up the vent through gravity. This is called backdrafting, and it happens very easily with a natural draft appliance. Combustion gases contain carbon monoxide, aka The Silent Killer. What happens if there's ever a fight for air with a mechanical exhaust appliance, such as a clothes dryer, bath fan, or kitchen hood fan? Imagine a fight between a feeble 90-lb kid with a broken leg vs. a heavyweight MMA fighter. Natural draft appliances are the feeble kid in this case, and they will lose every single time. The good news is that if a home has sufficient combustion air brought in, it'll never need to fight for it. 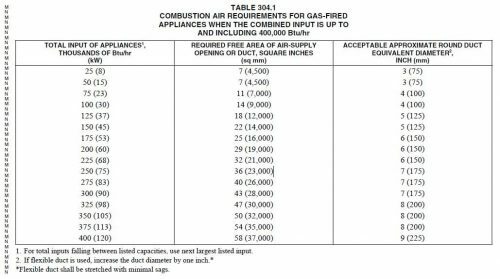 The Minnesota State Fuel Gas Code gives a few different options to provide combustion air to gas appliances, which can be found in section 304. I won't go into all of the details of that section, but I do want to cover part of it. First, the part that allows for a house to leak so much air that no dedicated combustion air duct is needed. Section 304.5 says, in so many words, that 50 cubic feet of indoor space is needed for every 1,000 BTUs of combustion. To put this into context, let's say that Bob has an 80,000 BTU boiler and a 40,000 BTU water heater. Pretty typical sizes. The total BTUs is 120k. He needs at least 120 x 50 cubic feet of basement space, or 6,000 cubic feet, to possibly not need a dedicated combustion air duct. His basement measures 30' x 25', and he has 7' ceilings, which equals 5,250 cubic feet of indoor space, and that's assuming it's all one big open space, or at least a space that all freely communicates; no doors separating rooms. In other words, Bob doesn't have a big enough basement. If his basement were 30' x 30' x 7' (6,300 cubic feet), that would be enough to not need a dedicated combustion air duct... based purely on this calculation. But this calculation doesn't take everything into account. The problem with these calculations is that they're generic. They know nothing about the tightness of the home, and they don't take other factors into account. For old, leaky houses with no mechanical devices that fight for air, this will probably be fine. Add a clothes dryer, kitchen fan, and a bathroom exhaust fan, and everything changes. To make it even worse, let's assume Bob sealed off the rim joists at his home, which will dramatically cut down on the amount of air that leaks into his house. The calculation given doesn't take all of this into account. Side note: The Minnesota Mechanical Code also has requirements for Makeup Air, which is designed to account for mechanical devices that might fight for combustion air. I blogged about this requirement many years ago: How to determine if makeup air is required and the 300 CFM myth. Most HVAC contractors seem to wisely ignore the provisions of section 304.5, and they simply install a combustion air duct anyway. Section 304.1, exception 4, says that combustion air may be determined by using Table 304.1. 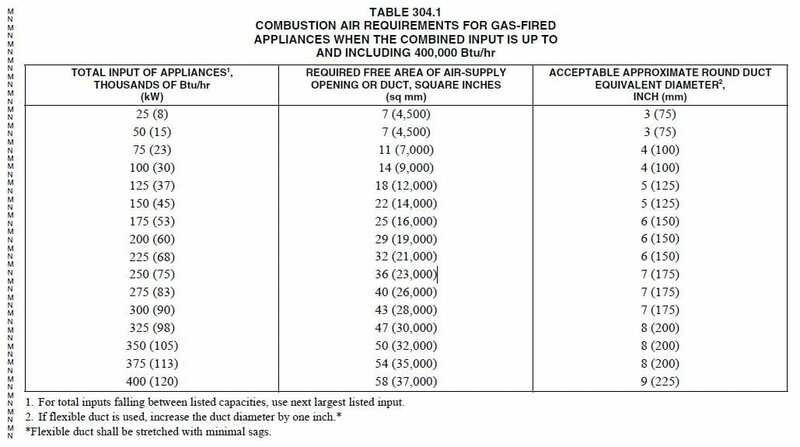 This is an easy-to-follow table that determines the required size of a dedicated combustion air duct, which brings in combustion air from the outside. According to that table, a 5" combustion air duct is sufficient for up to 150,000 BTUs of combustion. Because insulated flex duct is always used, footnote 2 of the table says that we need to increase the duct by 1", so a 6" combustion air duct would be acceptable. Hence the reason that 6" combustion air ducts end up getting installed in a large percentage of Minnesota homes. I like seeing combustion air ducts. I'm uncomfortable relying on air leakage to provide sufficient combustion air. When I inspect a home with a natural draft appliance and no combustion air duct, I look at the size of the basement. If it's a huge, open space and there aren't any big mechanical devices that will fight for air, I check for any signs of previous draft problems. I covered this extensively in my blog post titled Water Heater Backdrafting, Part 1 of 2: Why it Matters and What to Look For. If I don't find any signs of problems, I'll tell my client that the appliances are located in a large, open space, so combustion air will likely be sufficient, but a combustion air duct will likely be needed the next time that an appliance is replaced. If I find any signs backdrafting, I recommend further inspection by a qualified person, and I also recommend having a combustion air duct installed. In Bob's case, I gave him a short answer. I told him that the purpose of the combustion air duct is to help prevent deadly carbon monoxide from spilling back into the room, and that while he might potentially be ok eliminating this duct, there is absolutely no way that I would advise doing it. Leave the duct in place. To help cut down on cold air coming into the room, make a J at the bottom of the duct.